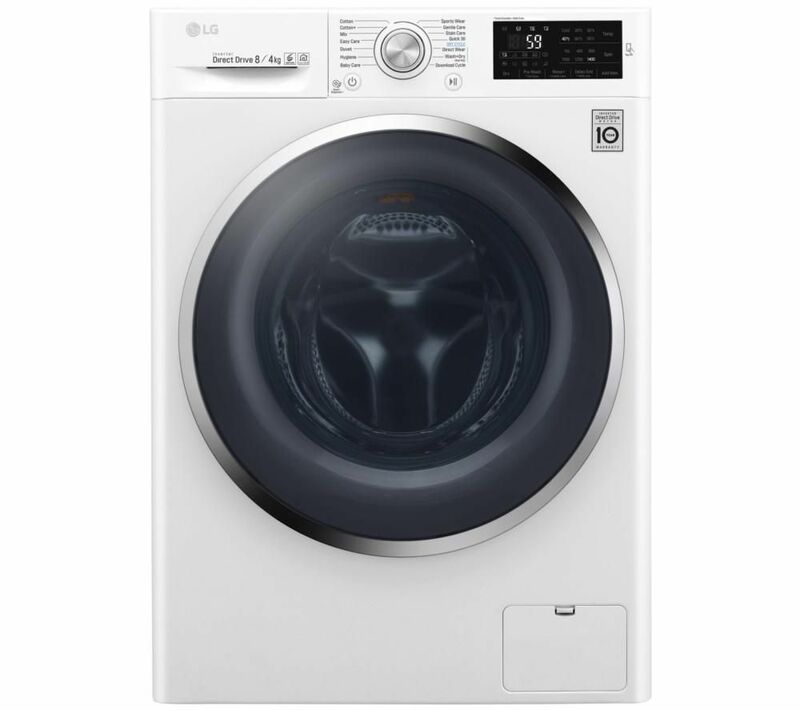 The LG Direct Drive F4J6AM2W NFC 8 kg Washer Dryer features an Inverter Direct Drive motor, an electromagnetic motor that provides a quiet and durable performance. With a 10 year warranty, you can use the appliance with complete confidence. An 8 kg wash capacity offers you plenty of room, allowing you to wash more clothes in fewer loads. Plus with a 4 kg drying capacity, you can save time as you complete the entire laundry process in one cycle. Using Smart ThinQ technology, the F4J6AM2W lets you connect your smartphone to the appliance using NFC. This means that you can download specialised wash cycles to make sure each wash meets your needs. Smart Diagnosis makes it easy to detect any potential problems and offers solutions, saving you the hassle of calling out an engineer. With a variety of built-in pre-set wash modes, you can choose the ideal settings to suit each load. A handy Pause & Add Items function allows you to pause the cycle, add any items you may have missed and continue the washing process. You can save money on your household bills as the F4J6AM2W has an A energy rating, resulting in an efficient performance. There is still a bit of a new smell to it when drying despite having it for a couple of weeks. But it’s not a terrible smell! Instructions are useless. People having diffs getting machine to just dry. If u need to dry only.... press on button, do not touch dial... press the dry button on the touch screen a few times to select drying time. It does not tell you this in the instruction book.